a platform that makes electronics both virtually unbreakable4 and imperceptible. 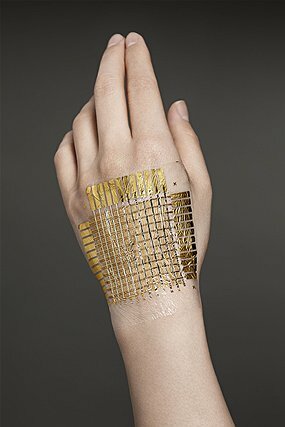 Fabricated directly on ultrathin (1 μm) polymer foils, our electronic circuits are light (3 g m−2) and ultraflexible and conform to their ambient, dynamic environment. Organic transistors with an ultra-dense oxide gate dielectric a few nanometres thick formed at room temperature enable sophisticated large-area electronic foils with unprecedented mechanical and environmental stability: they withstand repeated bending to radii of 5 μm and less, can be crumpled like paper, accommodate stretching up to 230% on prestrained elastomers, and can be operated at high temperatures and in aqueous environments.